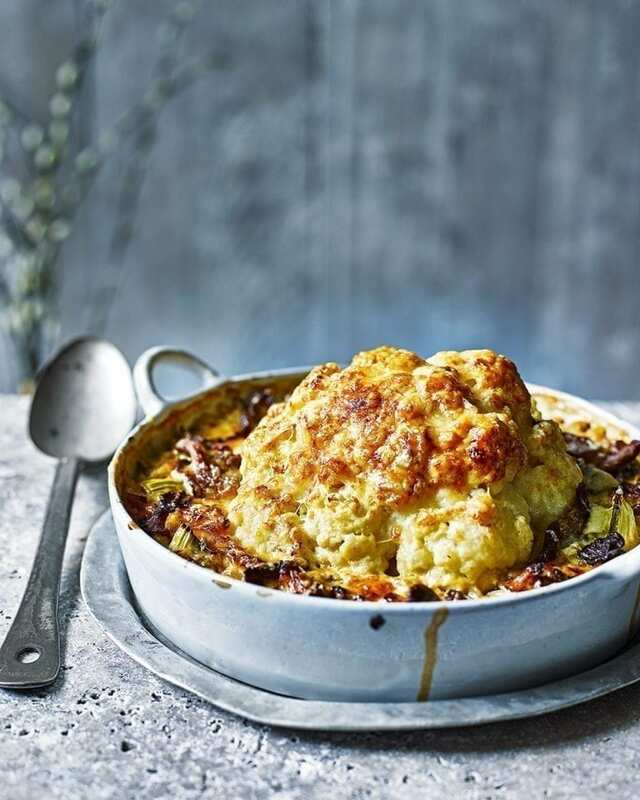 An impressive cauliflower cheese-inspired recipe made heartier with pearl barley and wild mushrooms. This is great as a vegetarian main served with greens. Heat the oven to 220°C/200°C fan/gas 7. Bring a large pan of water to the boil and cook the whole cauliflower for 10 minutes until nearly tender. Drain, refresh under cold water, then drain again and pat dry with kitchen paper. Heat a glug of oil in the casserole, add the onion and leeks and fry gently for 10 minutes until softened. Add the garlic, thyme sprigs and pearl barley, then fry for a few minutes. Turn up the heat, add the wine and bubble to reduce for 5 minutes, then add the stock and simmer for 20-25 minutes until the barley is nearly tender, stirring occasionally with a wooden spoon. Stir in the cream, reserved cauliflower leaves and the lemon juice, then simmer for another 5 minutes. Meanwhile, in a non-stick frying pan, heat a glug of oil over a high heat and fry the mushrooms for 5 minutes until they start to colour and are starting to soften. Add them to the sauce, taste and season. Sit the cauliflower on top of the sauce. Grate over the cheese, then bake in the oven for 30-35 minutes until golden and bubbling. To serve, drizzle over a little truffle oil, if you like. If you’re not vegetarian, fry smoked bacon lardons with the onion in step 2 for extra flavour. Prepare the cauliflower to the end of step 1 up to 24 hours ahead, then cover and chill.